While the teaser trailer doesn’t show much, there was a live-stream that the Creative Director Dave Richard and Gameplay Programmer Louis Mclean hosted by Not_Queen, the Community Manager. There, for the first time, showed off and highlighted the upcoming chapter before it was released. And in it, they talk about the new Killer, Survivor, Map, and Perks. 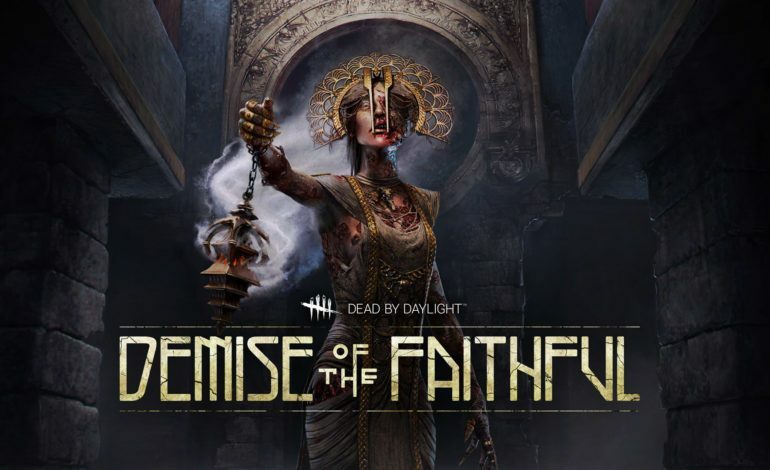 They also talk about how the Entity, the games overall non-corporeal protagonist, can take killers and survivors from any time period and any location from the world as this killer is based from ancient Babylonian times. The new killer is The Plague. The Plague was once a woman named Adiris, who was abandoned at a temple where she grew up as a servant for the priests and priestesses. There, her devotion and faith grew towards the Gods they worshipped until she was completely devout. However, tragedy strikes as the plague appears in her city when she’s older and the priest contracts and dies because of it. So Adiris took on the role of High Priestess where she became a symbol, a savior, for the people who loved her and loved her devotion to the Gods. Though her extreme devotion would cause her inevitable destruction as the plague returns and she and her follower contract it. They attempt to escape to the woods where everyone dies. However, in Adiris’s final breath, she prayed out to her Gods to help her. It was the Entity that responded. Ritualistic and unique, and apparently difficult to work with according to Mclean, The Plague uses an incense burner as her main weapon. Her Killer Power is known as ‘Vile Purge’. This power is literal bile that when it hits the survivors, they get sick. It’s not specified what this sickness does to the survivors, just that there is only one way to cure them and that is at the fountains, or Pools of Devotion. And with the Pools of Devotion, comes The Plague’s first perk, which is Corrupt Purge. Corrupt Purge allows The Plague to use the fountains after the survivors do, and take the corrupted sickness there and use it against the survivors. This sickness does a lot of damage over time. The next new perk is Infectious Fright. This means if one survivor is near another survivor that is put into the downed state by a basic attack, the nearby survivor will let out a scream and notify the killer where they are for a few seconds. And finally there is Corrupt Intervention, which, when used, has the Entity block the three most outer generators in the map for a certain amount of time. This means survivors will either have to wait for the Entity to stop blocking the generator, or go further into the map where the killer might be. Speaking of the map, the map is a reimagining of the temple that Adiris once served in called The Temple of Purgation. It’s currently located in the Red Forest. Like in some of the other maps, each time a generator is fixed, it opens up a new section to explore and go further into. The map also has several layers to go up and down in to find more items and surprises. The new Survivor is Jane Romero. Jane is described as the Dead by Daylight’s Universe version of Oprah Winfrey. She is a TV show Host, who becomes very popular and famous. However, one night, she does an interview that ends up being catastrophic and could be the demise of her show. She falls asleep in her car on the way home and drives into the river and disappears. This is where the Entity takes her into its trials. Jane’s first perk is Solidarity. She has the ability to heal other survivors. While injured, if she heals another survivor, she heals herself as well for 50% of what was done. Her next perk is Poised. This gives Jane a boost of confidence after a generator is fixed, allowing her to leave no scratch marks for 10 seconds as she makes her escape to either help a friend, move to the next generator, or to escape. And finally, the most requested perk is finally here: Head On. Head On is activated after standing in a locker for 3 seconds. Then, when the killer comes to the locker, the Survivor can perform a forceful forward action to stun the killer for 3 seconds allowing them to get away. This perk does cause the Exhaustion status, and cannot be used if Exhaustion is already in affect. The new map, Survivor, killer, and perks will all be available for the Public Test Build sometime later this week.